TOWSON – Seventeen-year-old Christopher Sutton’s life seems as rich as the music coming from the saxophone he has played for the past three years. In just a few months, the Calvert Hall College High School, Towson, graduate will arrive at Duke University’s North Carolina campus. There, he will study biomedical engineering under world-class faculty and cheer on the Blue Devils as he performs in the Duke University Marching Band. For the articulate teen, who has a passion for both medicine and engineering, this will be a stepping stone to his ultimate goal. At 17, Sutton, who previously attended Cardinal Gibbons School in Baltimore, is rounding out two years of participation in Northrop Grumman’s WORTHY program (Worthwhile to Help High School Youth).The program, which has operated for 13 years in Baltimore, exposes students such as Sutton to the benefits of engineering in a real-world environment, according to Ted Imes, director of community and education outreach in the Northrop Grumman Electronic Systems sector. 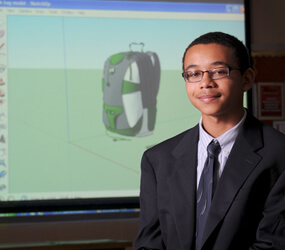 During his first year, Sutton, who is 5-feet-5 inches and accustomed to enduring the weight of AP textbooks in his backpack, developed a 3-D model of an ergonomically correct book bag. 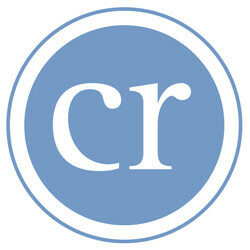 When he presented the model to an audience at Northrop Grumman at the end of the year, he was surprised by the feedback. “People started talking to me about maybe putting it into production, and I was like, ‘I didn’t even think about that,’” he said. This year, with the help of his Northrop Grumman mentors, he took a model of a heart and outfitted it so it can automatically run blood through the heart. Sutton said he was intimidated at first but his mentors have become his friends and he appreciates having professionals to whom he can look to for guidance and support. A parishioner of St. Edward in Baltimore, Sutton credits the rigorous Calvert Hall curriculum, variety of coursework and support of the administrators with helping to prepare him for both his internship and his future at Duke. He credits his mother, a school principal, with inspiring his interest in medicine and science. At Calvert Hall, Sutton, who also plays clarinet, served as a tutor and was a member of the National Honor Society and school band. Adding to his wealth of experience, Sutton also participated in the People to People Student Ambassador Program, where he had the opportunity to travel to China, Australia and New Zealand. With travel, music, strong academics, supportive and encouraging parents and experience with a leading global security company a part of his life, as well as a bright future ahead, Sutton has a rich life indeed. For more information about the WORTHY program, Baltimore City and Annapolis residents can contact worthy@ngc.com.